May be of interest to those who keep their pride and joy in moth balls for months. I bought some for mine because I was worried how long the car would be stood while the restoration was going on. If I remember rightly it has a shelf life of 4 or 5 years as opposed to 4 to 5 months that pump fuel now has. 18 months standing the fuel in the tank and carbs is still fine. Yes expensive but not as much as rebuilding the carbs, new pump and fuel tank. Boy....you really have to let fuel sit around forever before it turns. And if the car has been sitting around for that long, sadly you will have other issues to address. A can of dry gas, or a bottle of Marvel Mystery oil might have helped before the car was sent off to a long slumber. Or......keep the car running, and take it out in the winter when roads are clear ! Good for the car.....great for the owner !! Alas in my case not possible JC, it has no wheels or interior I do run the engine every so often though. I really didn’t want to take the risk of the ethanol absorbing moisture or running a newly rebuilt engine on fuel that’s octane rating was reducing on a daily basis. As Christopher says it might not be necessary but it helps me sleep at night. Next time you speak to Andy at Hutsons though Christopher ask him about a member on here who had his car with him on and off for a couple of years and what happened to his fuel tank and other parts of the fuel system. While not for everyone it is useful to know that ethanol free fuel is available. I got mine from Demon Tweeks. Some super-unleaded is ethanol free. BP Ultimate and Shell V-Power in some areas. As David says most of not all UK super unleaded fuel is ethanol free....for now. The fuel in the original post is very costly and unless you plan on laying up your car for a very long time, probably unnecessary. Petrol or gasoline is a complex mixture of mostly C4 to C12 hydrocarbons with those around C7 and C8 being the most common. Mostly alkanes there is a small percentage of alkenes and now a very small amount of cyclic aromatics for health reasons.....this is the straight run gasoline from the refinery. To it is added various additives and detergents and, historically tetraethyl lead, to maximise its resistance to compression-ignition or knock which is very damaging to spark ignition engines. As petrol is produced from crude oil and is a non renewable resource other fuels can be added to make the fuel "greener"....and one of these is ethanol which can be produced industrially or by fermentation of plant products. It is deemed more carbon neutral than petrol. Interesting to note that the octane rating of ethanol is 108.5. Trouble is ethanol absorbs moisture far more readily that distillate fuel. Ethanol and especially damp ethanol is known to attack rubber components and some metal alloy components found in the fuel systems of older cars so there is a good reason to avoid it. However ethanol free fuel is still available and provided your fuel tank is sealed and clean will last for some months with little deterioration. Kept in a sealed plastic container even ethanol containing fuel will last for some months with little or no degradation if kept cool and dark. To me at least, the extremely high cost of the stuff in the original post far outweighs any benefit it provides. If you plan to lay your car up for months the best advice is to drain all the fuel anyway. It can then be stored in a sealed container without significant problem for several months. As of September 2017 BP no longer guarantee that there is no ethanol in their Ultimate branded petrol products only that it will be less than 5%. "This means that, in the UK, Shell regular unleaded and Shell V-Power unleaded are likely to contain some ethanol, but it will not be present at more than 5%"
I don't want to get into the whole ethanol destroys classic cars debate. As Julian says above, at that concentration it probably won't cause any problem at all. I merely wanted some fuel that I knew definitely didn't contain ethanol and had a long shelf life. Out of interest and to satisfy my own curiosity can anyone see a problem with the following experiment? I fill a large jam jar with Shell V Power or similar, place a piece of cast aluminium and mild steel in it and then fit the lid with a small breather hole to mimic a fuel tank. I then leave this in the garage for 3/6/9 months and observe what if anything happens and post on this thread. Anything else I could do to make it more scientific? And don't say "get out more Simon"
Up to now i have never had overwintering problems with the fuel in my cars , i use "ethanol shield" even though i use ethanol free fuel it also works as a stabaliser so covers both . 2 years ago i started using Ethanol shield after consistent over winter problems with my lawnmower [ Carb diaphram ] using the same petrol as in the E type ,so as i went to buy my yearly carb diapram the guys at the mower shop said "use this ,it works , it also reduces engine temperature if you do have to use an ethanol fuel . Up to now it has solved the issue . Last edited by steve3.8 on Wed Oct 03, 2018 8:06 am, edited 1 time in total. Let's throw a cat among the pigeons and suggest you use aviation fuel, 100LL, which has the advantage of not losing its octane rating over the winter and is a far more stable fuel than car petrol. Interesting that you mention aviation fuel Geoff. You being a pilot and all, what is the current legislation regarding the use of fuel containing ethanol in light aircraft? I seem to remember it was illegal, is that still the case? Simon. I see nothing wrong with your test. Make sure the metals are part in and part out of the fuel as it is fuel in the presence of air (oxygen) that is most likely to generate corrosion of the metal. If you have a bit of rubber fuel line pop that in a (separate) jar too? Try it. Let us know the results. I have had little issue with either of my cars but I use super in both. And they are periodically run through the winter too. Damp in the fuel is likely to cause corrosion, particularly corrosion of steel in the presence of air. Ethanol is known to cause deterioration of rubber components in fuel systems. 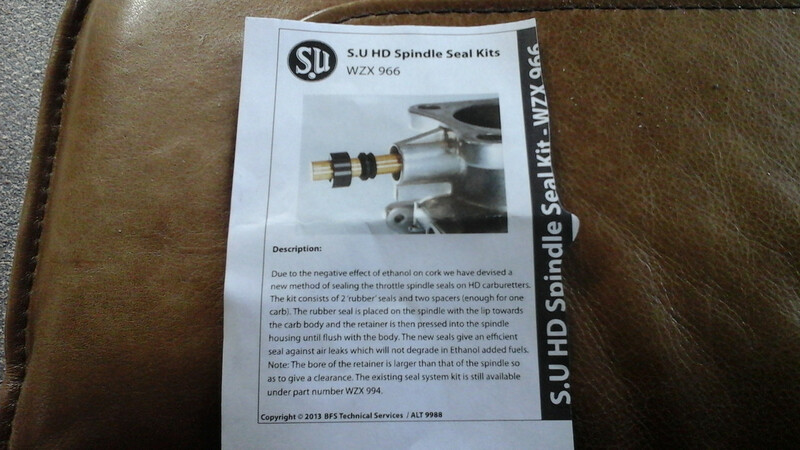 So diaphragms in SU and Stromberg carburettors, rubber fuel hoses etc. Hoses particularly must be regularly inspected and periodically replaced. There have been a number of fires here in the UK in classics recently that have been attributed to fuel line failures and while the reports I have read have not been specific I'd guess it is the rubber hoses that have burst rather than the metal lines. Copper lines particularly will be unaffected by fuel containing ethanol. Aside from corrosion issues, fuel deteriorates as the lighter fractions....the C4,5 and 6 components evaporate away first leaving the heaviest behind. This reduces the overall volatility of the fuel and this severely affects its performance. Evaporation can't happen from a sealed container and while car fuel tanks are vented the losses over four months in winter will be minimal unless you leave the fuel cap off! I have never experienced any fuel issues even after four of six weeks standing idle. My MG starts first time 90% of the time. After a month standing the E type will take two or three crank sessions to fire but once running all is fine. what is the current legislation regarding the use of fuel containing ethanol in light aircraft? I seem to remember it was illegal, is that still the case? With the caveat that I've hung up my headset, ethanol and aircraft fuel systems and engines don't go well together. Attacking rubber components, holds water etc. all things that wouldn't be good for an aircraft at 10,000 feet. Some more modern aircraft engines are designed to accept ethanol, but as so many old aircraft still have ancient engines and fuel pipes then it isn't good for them. I don’t believe there is anything wrong with using Avgas 100LL, but you wouldn’t really want pay the extra cost of it just to sit in your tank during a rebuild. I keep a 25 litre jerrycan of Avgas due to its lack of ethanol, high leaded content and long shelf life. I just go to one of my small local airfields where there is a self serve pump for Avgas 100LL for visiting planes airside. I use it in my old motorbikes which have fibreglass tanks, as the ethanol in normal unleaded would quickly soften and destroy the tank. After running the bikes in competition, I still drain the tank and carburettor bowl to remove all traces of fuel, especially as these are two stroke and the oil mix would clog the carb if left to dry out. I obviously don’t run the Jag on pure Avgas 100LL, but I couldn’t see the harm in putting in a small amount during the season for the higher octane and lead properties. There is also the Ethanil kit which has been discussed elsewhere on here but I tried it myself following some Youtube guides. I'm just using that in the garden machinery at the moment but could easily put 5 litres in the car over winter. When I worked abroad and left my E Type standing for 3 years I left the tank full to the brim and then discarded this petrol when I took the car out of storage. I've had no problems with corrosion or rubber parts degrading. '67 S1.5 FHC, manual, maroon with black interior. Originally exported to Arizona but 'repatriated' in '89. Since converted to RHD and triple SUs.